Make an angle, extend them in a straight line or even a stair step pattern. This modular concrete bench offers versatility and style that will enhance any seating area with matching stackable sections that can either be used as planters or waste receptacles. Brown rigid plastic lid with square opening fits on top of a stacking unit to create a waste receptacle. Heavy-Duty steel reinforced construction makes this modular bench an excellent choice for commercial as well as residential use. Sealed with water repellent sealer for protection and durability. Choose from the many different colors and finishes shown below. 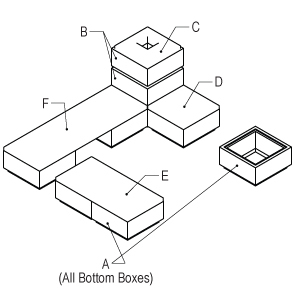 In order to stack a planter or waste receptacle two or three units high, the stacking units should be placed above a standard unit (A) with a bottom.